I've been given the honour of partaking in Harmony of Heroes, a HUGE Smash Bros fan-arrangement album with 101 TRACKS. These span across franchises from three Super Smash Bros games, and there's everything from Mario to Zelda to Earthbound to Metal Gear to original Smash Bros music arrangements. There are real orchestras, choirs, genres from electronic to orchestral to jazz to metal to rap, and a whole lot of musicians involved (I'd say hundreds). It's been a year and a half in the making and you simply must check it out and download it. So yeah, check all that stuff out and tell me what you think! You know, I've been meaning to write a newspost like this for a while now. Music has become such a huge part of my life now and I thought it'd be cool to have a place where I can write up the whole story of how I became a musician, and gather all my major accomplishments and breakthroughs. Plus, I almost always use this space as a functional tool for stuff like advertising my music, announcing fan milestones, and so on, so it's nice to have a bit of variety. Needless to say, long post incoming, and you sure as hell aren't getting a TL;DR! Right, I guess I'll start from the very beginning. My childhood was not very musical. For the first 10 years of my life or so, I had no interest in music and in fact actively ignored it. My passion at the time was for writing. I used to write these cute little poems, and I would secretly enjoy getting English essays at school, even though I wouldn't openly admit it at the risk of sounding like a nerd. Despite this disinterest towards anything musical, at 11 I actually started taking piano lessons, and not the kind that parents force their kids to go to. It was all my own decision. To this day I don't know what exactly convinced me, but it might've been watching my childhood friend Tristan play the piano and think that it'd be a pretty cool thing for me to do too. That's when my fondness towards music sparked. I was still about as musical as a potato but piano was definitely my first nudge towards changing that. I studied hard for my exams, and got into the best secondary school of the country, along with a few other primary school classmates of mine, notably Echo. While I was taking piano lessons regularly, I was still nuts about writing. I started writing books at 12, a few of which were written in collaboration with Echo as well. Meanwhile, a friend of mine told me about Newgrounds and how it has free games, so I decided to take a visit. I found the flash games pretty addictive and decided to stay, eventually making an account entitled 'Supersteph54' (you can see why I got my username changed). When does music come in? Well, after playing Super Crazy Guitar Maniac Deluxe 2, I stumbled upon the Newgrounds Audio Portal, and it quite certainly opened my eyes. I always thought making music was what only bands, orchestras or DJs do, and there I was, with hundreds of thousands of tracks in front of me made by normal people only a few years older than me, and some of it was actually GOOD. Perhaps inspired by this discovery, I proposed to Echo that it'd be a nifty idea to write theme songs for our books as well, to which he agreed. I searched for a music notation software, and found one called Mozart9. Using the limited music theory I gathered from piano lessons, I started writing my first ever musical notes, and sending the results to Echo for him to add instrumentation to with an old DAW called Cakewalk. Eventually, we finished our first ever track - a theme song for one of my books entitled "The Ten and a Half Heroes". So that was it. I was making music. Not very good music, suffice to say, but music. We kept writing more books and hence, more theme songs, but slowly the writing came to an end as making music took over. I kept using the very limiting Mozart9 software to write my music, and while I wasn't getting very far, I didn't think to search for more music software. I then stumbled across @Blackhole12's music, in particular this one, and damn did I enjoy that track! I checked the description, where he mentioned how much his FL Studio project file kept crashing, and I thought to myself, "Hmm, FL Studio? What's this?". I did some googling, found the software, and pirated it. Yeah, I know, piracy... I mean, since then I've bought it legitimately, but at the time I had no money of my own and making music was just a foolish dream. So yes, I had FL Studio, and the funniest thing about it was that if Blackhole12 hadn't complained about FL Studio in his song description, then I would've never obtained FL, and might not be where I am today. So thank god for FL crashing. Funny how things work out! Soon after I got FL, Echo followed suit. I made my first thing in FL, despite having no idea what I was doing. Of course, it sounded like crap, but everyone starts somewhere! It wasn't long before I made an arrangement of one of my favourite video game themes at the time, the Mortal Kombat theme. Despite that being a load of crap as well, it was actually my first ever track which received a truly positive response in the reviews. I was getting 10 after 10 after 10. People were favouriting me and my track. And wow, it felt GOOD. I think it was then that my music hobby took a turn forward. My mentality switched from "let's see what I can make with this complicated program" to "I've got to make something better! I have a fanbase now!". It was exciting stuff. From then, it was a gradual but consistent climb upwards. I improved slightly with each new track I posted. I also joined the Review Request Club (RRC) - a small club on the forums dedicated to reviewing other people's flash and audio (no art portal at the time). I enjoyed reviewing other people's works (perhaps due to my aforementioned affection towards writing) so I felt right at home over there. I mention the RRC over here because I feel that it was a very important part of my maturing as a musician. Critically analysing other people's audio and getting responses and reviews back from the musicians behind those tracks helped widen my horizons and eventually judge my own music from a critical standpoint. Soon after discovering the RRC, I discovered the Audio Forum. I posted in there now and again, though mostly naive FL Studio questions and uneducated opinions. I found it enjoyable posting there and with the opening of the first ever NGADM and me eventually becoming an audio moderator later on, I started integrating with the community a little more. I was, and still am, extremely psyched about being a regular of the Audio Forum, currently with over 6,000 forum posts. Forming part of a community of like-minded people who you actually get along with is a great feeling, even if I've never been as avid of a community member as I would've liked (I don't visit many IRC chats and don't post terribly often). Still, to this date I hold nothing but respect towards my fellow musicians and I'm honoured to be a part of it! I digress. In the music department, I was still writing crappy techno, until Echo and I eventually agreed on buying East/West Symphonic Orchestra Silver after recommendations from @DavidOrr and @ApproachingNirvana and inspiration from Denny Schneidemesser's music, especially this one. It wasn't fun using that plugin with just 512 MB of RAM, I'll give you that! 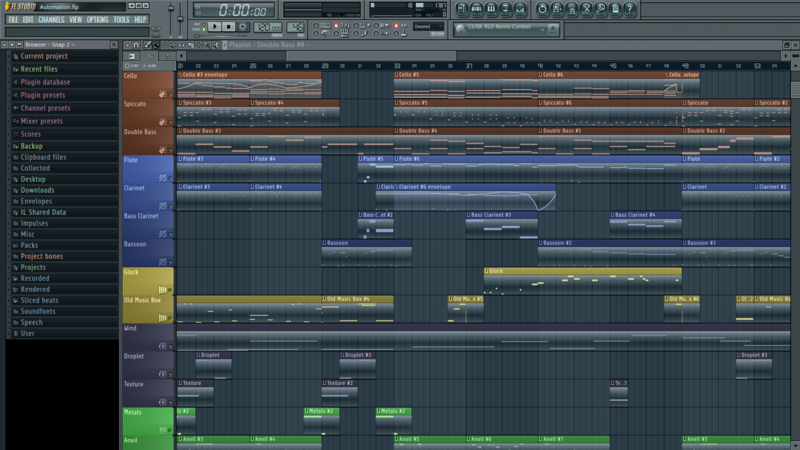 Still, it meant I started writing more orchestral-focused music, and kicked things off with this track. The huge leap in quality overwhelmed me, and despite having many issues with East/West due to an outdated PC and badly-coded PLAY engine, I pulled through, making more and more orchestral music. I composed Legend, a middle-eastern-inspired track, to kick start 2011. I mention it because it's probably my first ever decent piece of music. I remember @Buoy telling me in his review "huh?! I don't recall you being this good? ", and while I didn't make much of it at the time, I realise now why he had that reaction. Looking back, Legend was leaps and bounds above anything else I had done before it in terms of quality. Around this time, I also landed my first ever gig - $200 for around four 3-minute soundtracks for a game called Eternal Quest (which was actually pretty deep into development and I even got to play the game). I was naive and stupid, deciding not to write up a contract with the game developer at the start, and he ended up just disappearing after I finished all the music, so I never got the $200. To this day I've never heard anything about it again. The funniest part about this is that the game developer in question (who added me on MSN) literally called himself "Trickster" on MSN. He tricked me real good. Towards the end of the year, a friend of mine told me about Harmony of a Hunter, a fan-made Metroid arrangement album organised by @Darrenkerwin. I was quite into arranging music, and video games (even though I knew nothing about Metroid). I contacted Darren, and he gave me a track to arrange for the album. Before I knew it, I became very close friends with Darren (and still am to this day), and I even made three full pieces of music for the album. This was one of the biggest deals in my music "career" ever. Harmony of a Hunter not only netted me a close friend, but exposure, tons of contacts ranging from musicians to artists to singers, and a strong liking towards Metroid and its music. On top of that, I'm now the assistant director for Harmony of Heroes, an ENORMOUS Smash Bros arrangement album set to be released by the end of this year. The closer we get to the present, the more musical accomplishments I have. I made Sanctuary, which was my first ever track that truly exploded in popularity on Newgrounds (reaching up to 11th on the Best Audio of 2012 list on Newgrounds), I made my longest song ever, I played a vital role in a pretty large collaboration to remake the Okami Reset theme, I won around 500 Euro due to being commissioned to compose a soundtrack for a game which won a competition, I took part in a large school event at my sixth form as the music director, and kind of recently I had one of my tracks used in the extremely popular mobile game Geometry Dash. That last one landed me huge amounts of popularity, especially on YouTube, since Geometry Dash is top selling on Google Play and the App Store, beating the likes of Fruit Ninja and Temple Run (but not quite Candy Crush). I'm very lucky to be a part of such a well-produced game, and I've got to admit it's a pretty cool feeling when you see random people on buses or whatever on their mobile playing a game that uses your music, or even having PewDiePie play it. Since the beginning, at the current time of writing, I've organised five NGADMs with Echo (on my sixth at the moment), accumulated over 600 fans on Newgrounds alone (and perhaps over 2,000 fans/subscibers overall), made about 150 pieces of music, written close to 1000 audio reviews, taken part in competitions, bought thousands of euro worth of music software/hardware, and met tons of awesome people who I consider dear friends or people I look up to/respect. What is music to me now? What I can say for certain is that it's still a hobby, albeit a very time-consuming and expensive one. I sometimes ask myself whether I should make it my professional career, but due to the fact that I'm half-deaf and the fact that being a musician isn't exactly a financially stable job, I don't see that as a viable option. However, one thing is for sure; I won't stop making music any time soon. I sometimes go through pretty long periods where I regrettably don't post any music, due to being really busy a lot of the time with loads of different things, but if there's one thing I keep doing, it's coming back and writing more music. I'm proud to be a musician, albeit an amateur one who has a long way to go, and I'm excited to see what the future has in store. Heya! This here is the newspost for the Newgrounds Audio Deathmatch 2014! What is this mouthful of a name, you ask? Well, it isn't in orange for nothing. Click on it. Also check out camoshark's list to keep up to date with the contest! Just like every year, this year the contest is split into two; the AUDITIONS phase and the KNOCKOUT phase. Each phase has its own separate rules, so make sure you read it all, because - plot twist - some things which are banned in one phase are totally OK in the other! 4.) If you're entering as a team of two, your audition can be a collaborative effort between you and your collab partner, or a track by any one of you individually. Remember, though, that the prize will have to be split between both of you! Make sure you state clearly who your partner is in your audition, and preferably link to his/her user page. 1.) Every track you make in the knockout contest has to be made from scratch, by you, for the competition. No remixes, covers, arrangements, or revisiting old tracks. Having said that, you may ask someone to play an instrument for you or sing for you, as long as all the composition and production is done by you. 2.) This year we want to really encourage entering as a team. Remember that you can enter as a team and not even do one single collaboration, deciding to simply split the workload (one musician does one round, another musician does another, etc). 5.) Keep to the deadlines of each round! This contest is massive and tough; you're expected to dish out a track every two weeks until you're eliminated! If you can't keep up with this pace, or you know you're going to be busy, then reconsider taking part. Walkovers just make things messy and hard to handle. Having said that, if you notify one of us as early as possible, we may consider asking the highest-scoring loser of a previous round to take part instead of you, so feel free to let us know if something crops up during the contest and you have to go. 5.) Lastly, despite the cash prize, this contest is and always was a means to have some competitive fun, keyword being FUN. Do not enter it with the sole intent of winning; we encourage friendly discussion, posting reviews on each other's tracks and being a good sport. However, don't all be softies either. This is called a deathmatch for a reason! Now put your game face on. * Note 2: All dates are inclusive. For example, if a deadline is on a Tuesday, then the actual deadline is Tuesday at midnight EDT, meaning you have all of Tuesday to finish your submission. Mine is the first remix that appears in the preview - I took the Jungle Level theme from Brawl. We've also got other remixes by renowned Newgrounds musicians such as steampianist and Echo showcased in the trailer. Check it out and tell me what you think in the comments! First off, check out THIS remix RalaiyX3 made for my track The Festival. How he managed to turn a folk/orchestral track into electro-house is beyond me, but HE DID IT. In other news, I just got my Grade 6 piano exam results today. All my hard work paid off, because despite me being a nervous trainwreck during that exam, I landed a distinction! Goodbye studying. Goodbye university. Goodbye social life. Goodbye responsibilities. What? Two newsposts in the timespan of a week? step, wut is up wit yu? I'll tell you what's up. I made music for a game developer here on Newgrounds - PianoGamer. Months ago, he approached me, asking if I can provide some music for a game of his which he's submitting to this competition held in a university in Norway, called the Norwegian Game Awards. I thought "why not?" and after around 50 hours of work I managed to make four tracks for the game - three thematic gameplay tracks and one menu theme. After I was done with those, he informed me what the cash prizes for this contest would be and I was blown away to see that the main prize is 42,000 NOK (Norwegian Dollars) which translates almost exactly to 7 grand in US dollars, and if we won I'd get 10% of that. Well guess what? We won! This is a huge change from what I'm used to. I don't ever get paid for my music. One time I was promised to be paid 200 dollars after I finish some music for a game, and when I finished it, the game developers disappeared and I never got the money. Another time, I made music for a game along with another musician, but gave my share of the payment to a friend of mine who was robbed of his music gear. I've also made a demo song for a new VST released by Versillian Studios! It's a sampled Dan Tranh. The Dan Tranh is a traditional Vietnamese zither (basically a plucked instrument that you place on a surface and play horizontally), and I had a lot of fun with it. Uh yeah that's it, lamest conclusion ever but WHATEVERRRRR. I've noticed that shamefully, a lot of my recent newsposts are me advertising my music, a friend's project, any other project I'm interested in or a milestone of amount of fans I've reached. This is actually kind of lame so I thought I'd use this space for what it was actually intended for. So here's what's been happening in the riveting, exciting life of Step x_x. On the subject of school, I finished my sixth form finals a few months ago, and now I'm off to university, since I received my letter of acceptance a few days ago. I was pleased to find out that I got an A in both my majors (Computing and Pure Mathematics), an A in two of my subjects at intermediate level (English and Physics) and a B in the other two intermediate subjects (Systems of Knowledge and Philosophy). I'm kind of bummed I didn't get an A in each subject, especially Philosophy since I did everything by the book for that exam, but hey, they're both intermediate subjects, and I never really liked Systems of Knowledge anyway (it's a compulsory "general knowledge" subject taught here in Malta, which encapsulates knowledge from various areas of study, such as environmental values, democracy, aesthetics, etc). So yeah, good grades thankfully! I'm taking programming (more specifically Artificial Intelligence) as a course in university. We only have one university here, aptly named the University of Malta, and that was the closest course there is to game development, which is what I want as my career, so I didn't have much choice! Friends and family are all telling me to take up music, but honestly, I don't think I can. I'm unfortunately half-deaf, and my hearing is getting worse (at least it was last I went for a check-up, but I haven't gone for a while). I love music, but I like programming (and anything related to problem-solving) equally if not more, and a programming career is more financially-stable, so it seems like a no-brainer. Speaking of music, I'm still making it, even if it's not at a pace I would like it to be! I landed 3rd place in the NGMT contest, which works on a system of public voting. There are three "rounds", and each round has its own theme and challenge. I took part in one with some help from my good friend Echo and we managed to get first place in the round and third place overall (despite only taking part in one round), which I'm quite happy with. I also placed in the NATA music contest, and got my track used in a whopping eight NATA animations, which is also awesome. Speaking of that, my music was used in an incredible animation by NeroGeist, which I am still really happy about. It got me a fair amount of exposure and when he works on a new episode I might be the one scoring it too, something I'm incredibly excited about. I'm also taking part in Harmony of Heroes, a huge Super Smash Bros remix album. Apart from the songs I'm working on for that album, I also plan on doing an arrangement of this awesome song, with Echo, Shanath, and Video Games Live singer Laura Intravia. It's been in the works for a while now and other than the incredible vocals I've received from Laura and a fantastic MIDI file of the arrangement by Shanath, nothing much has been done yet, but rest assured it will be done! Still in the music department, Echo and I are still hosting the NGADM 2013 this year, along with five other judges (but you're a few months too late to join). I highly suggest checking out this newspost for a list of all the NGADM tracks this year. The level of quality is outstanding. Regarding gaming... Anyone who knows me knows I'm an avid gamer. I don't game as much as I'd like to due to having so much stuff to do at every given moment of my life, but one cool thing to mention is that I've recently finished Amnesia: A Machine for Pigs. Loved the game - not as scary or as puzzling as the first, but I think it was a worthy successor. I've also bought a Wii U and I'm currently hooked on Monster Hunter 3 Ultimate. May I add that I'm a huge Monster Hunter fan. I've invested a collective 1500+ hours into that game and Monster Hunter Tri on the Wii, along with 1000+ forum posts in a Monster Hunter forum, and I've written an eight-minute medley of the music from the game. It's an excellent franchise. What I like the most about it is that unlike so many other recent games, it doesn't hold your hand at all. It's a very hard game that takes a while to get used to and has a lot of deep gameplay mechanics and customisation. On top of that, it's an absolute blast to play online with friends, and through that game I've met what I consider to be some of my closest friends! Apart from that, I bought the Humble Bundle, and played through the Dead Space series (absolutely excellent series, although slowly loses its horror elements with every sequel), Mirror's Edge (also a great game, if a bit short), and I'm currently playing Battlefield 3 online. BF3 is not as bad as I expected it to be. It's not my kind of game, but for what it's worth, it's a pretty fun game, and the destructible landscapes are undeniably badass. I'm somewhat considering getting a PS4 in the distant future when the price is actually reasonable, because there are some PS3 exclusives that I really want to play, such as Metal Gear Solid 4, Journey, Heavy Rain and The Last of Us. This is all, of course, assuming that they make those PS3 games available in the PSN store. Lastly, currently hooked on The Walking Dead and Avatar: The Legend of Korra. Considering season 4 is coming out soon for the former and season 2 just came out for the latter, I've got a lot to look forward to. Aaand that's about it! Yes it's long, but as a lot of you who have seen my Newgrounds reviews are aware, writing in length is how I roll :3. For the same platform/puzzle game I made these tracks for, I've made one final track to be used in a cave/laboratory-themed level. I know that to you I probably just seem like one random guy asking for feedback... and to be honest, I am... but I would love some feedback anyways :3.